Did you know that your major medical health insurance policy should cover certain childhood services? What is covered under your health insurance plan? 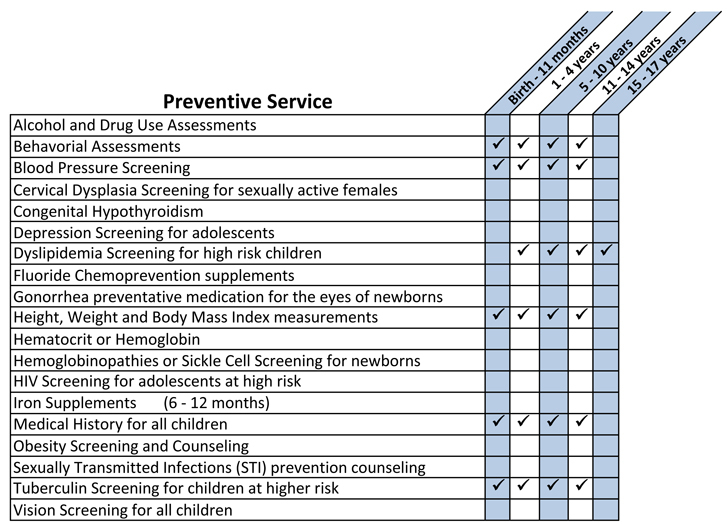 Under the Delaware Title 18 Insurance code the below services must be available to all children insured under a major medical health insurance policy issued in the state. For a more detailed listing of these services, please see our poster (PDF). To view/print a poster (PDF) listing the services covered under the Affordable Care Act and state mandates, click here. For more information on the Affordable Care Act, visit www.HealthCare.gov. You can also find additional information on this site regarding immunizations by reading this Fact Sheet. The Delaware Division of Public Health has a “Vaccines for Children Program” program which helps families by providing FREE VACCINES to eligible children through enrolled doctors. Visit their website for more information. You can contact the office of Insurance Commissioner in state toll free (800) 282-8611 or (302) 674-7310.